Stat5 activation occurs in response to many ligands including prolactin, IL-2, growth hormone, and GM-CSF. Tyr694 phosphorylation is obligatory activation of Stat5 (1,2), and is mediated by Src upon erythropoietin stimulation (3). 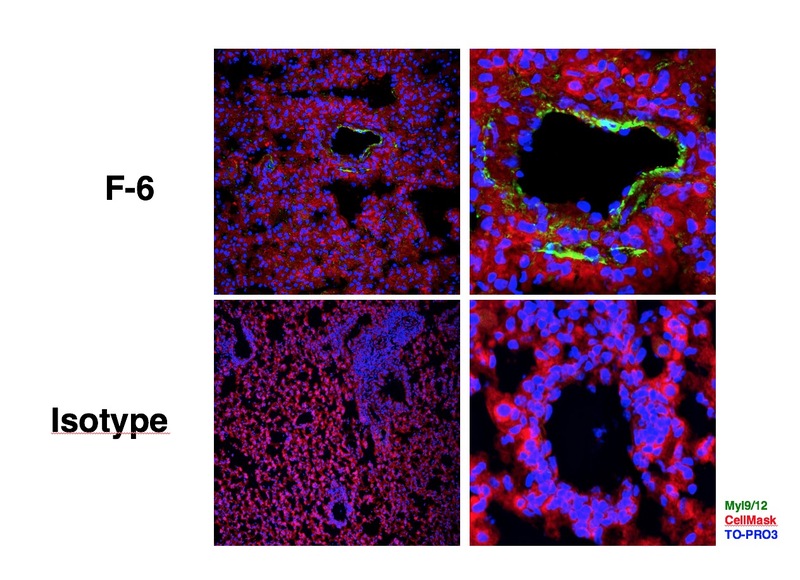 Phospho Stat5 is constitutively active in some leukemic cell types (4), and phospho Stat5 is found in some endothelial cells when treated with IL-3, suggesting its involvement in cell motility and angiogenesis (5). Stat5 has been shown to be encoded by two separate genes, Stat5a and Stat5b, which share over 90% amino acid sequence identity. In different cell types, Stat5a and Stat5b are independently regulated and activated. For example, interferon treatment predominantly activates Stat5a in U937 cells and Stat5b in HeLa cells (6). 1. Gouilleux, F. et al. (1994) EMBO J. 13:4361-4369. 2. Wakao, H. et al. (1994) EMBO J. 13:2182-2191. 3. 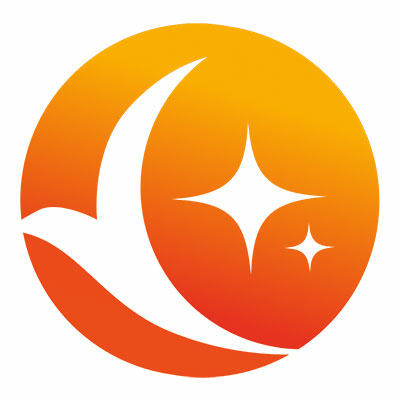 Okutani, Y. et al. (2001) Oncogene. 20:6643-6650. 4. Demoulin, J.B. et al. (1999) J. Biol. Chem. 274:25855-25861. 5. Dentelli, P. et al. (1999) J. Immunol. 163:2151-2159. 6. 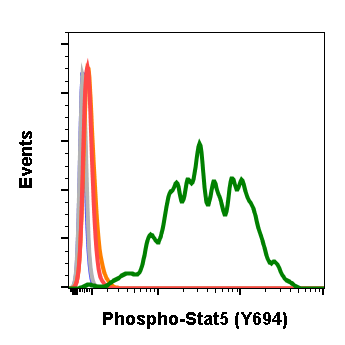 Meinke, A. et al. (1996) Mol. Cell. Biol. 16:6937-6944. 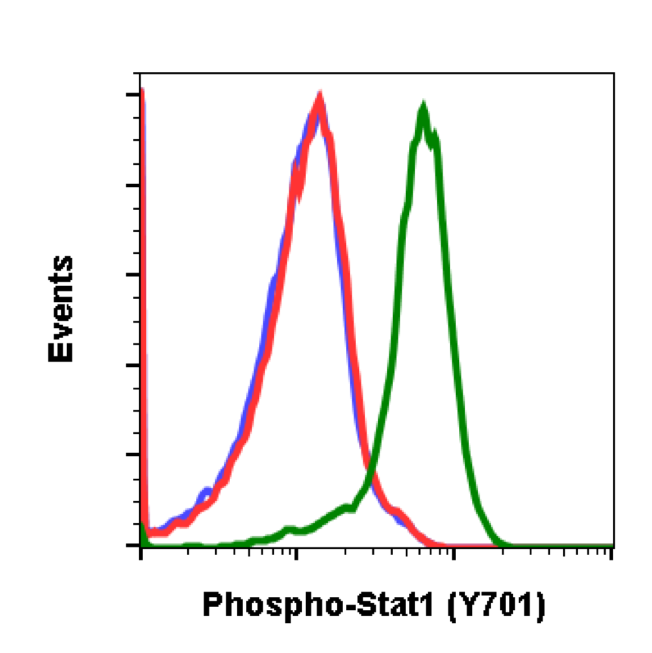 Flow cytometric analysis of 3T3 cells secondary antibody only negative control (blue) or untreated (grey) or treated with pervanadate (orange) using 0.1 µg/mL isotype control Cat. 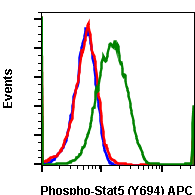 #2141 or untreated (red) or pervanadate (green) using Phospho-Stat5 (Tyr694) antibody Stat5Y694-G11 at 0.1 µg/mL. Cat #2326. 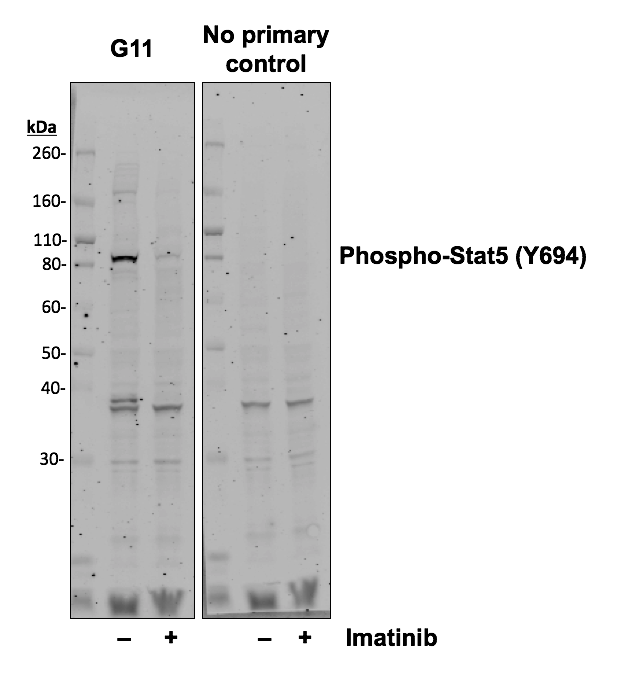 Western blot analysis of K562 cell extract untreated or treated with imatinib using 0.01µg/mL Phospho-Stat5 (Tyr694) antibody Stat5Y694-G11. Cat. #2326. 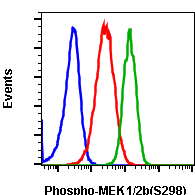 Also shown is a control blot at the same exposure level and omitting only the primary antibody. 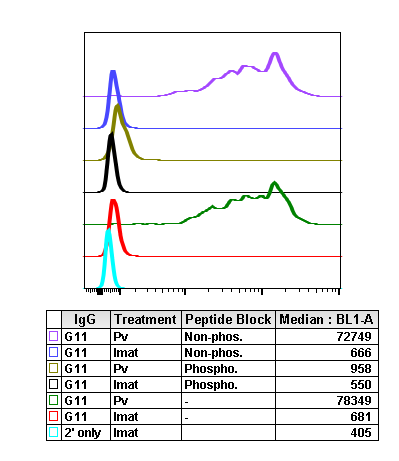 Peptide blocking flow cytometric analysis of 3T3 cells secondary antibody only negative control (light blue) or treated with imatinib (red) or pervanadate-treated (green) or imatinib and blocked with phospho-peptide (black) or pervanadate and blocked with phospho peptide (gold) or imatinib and blocked with non-phospho peptide (dark blue) or pervanadate and blocked with non-phospho peptide (purple) using Phospho-Stat5 (Tyr694) antibody Stat5Y694-G11 at 0.1 µg/mL. Cat. #2326. 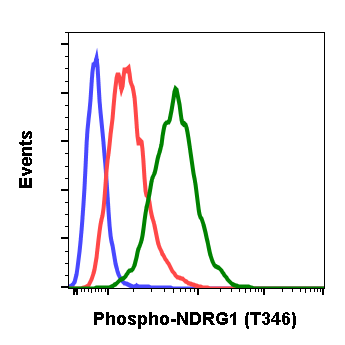 Flow cytometric analysis of K562 cells secondary antibody only negative control (blue) or untreated (grey) or treated with pervanadate (orange) using 0.1 µg/mL isotype control Cat. 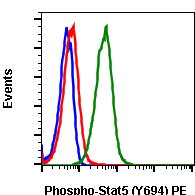 #2141 or untreated (red) or pervanadate (green) using Phospho-Stat5 (Tyr694) antibody Stat5Y694-G11 at 0.1 µg/mL. Cat #2326. 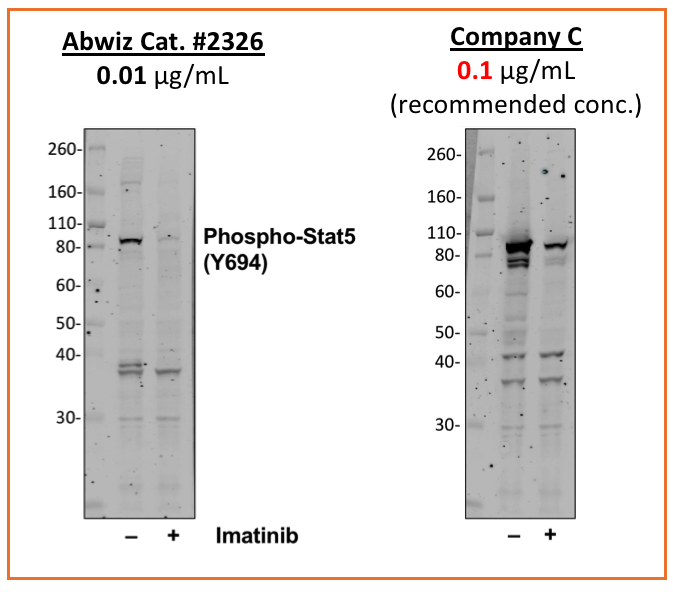 Western blot analysis of K562 cell extract untreated or treated with imatinib using 0.01 µg/mL Phospho-Stat5 (Tyr694) antibody Stat5Y694-G11 Cat. 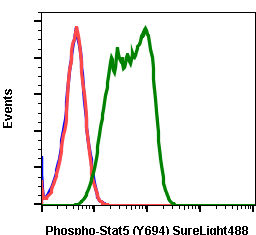 #2326 or Company C antibody at 0.1 µg/mL (manufacturer’s recommended concentration) developed using the same exposure.